This is a creative way to give a cash gift that is best suited as a wedding gift or possibly a housewarming gift. Please ignore my lacklustre photography in this one, I was in a huge rush and wanted to grab a quick picture on my phone. I have to thank two of my friends, J&J, for inspiring this one with their registry! As we have long established, cash is the best wedding gift, however that often leads to the complaint that it is too boring. No one ever said it had to be boring! Here is yet another way to spice up your cash gift and make it interesting and memorable. All you have to do is pick a rolling pin off of the wedding registry. This one happens to be a marble one. Then, you have two options. You can either buy some money themed scrapbooking paper (here ) or some money print wrapping paper (here ), or you can make some on your printer. All you have to do is check the size of your rolling pin, mine was a little bit less than a regular letter size piece of paper, and open up a wordprocessing document. Find some money clip art and then plaster it all over the page! Print it off and voila, you have some money wrapping paper! I am a huge advocate for sending email money transfers, as they are both secure and very convenient for the couple. You can write a note in the card, or on a piece of paper and stick it to the rolling pin. Then wrap it with your money themed wrapping paper. Done and done, your friends will be rolling in dough. Pick an etransfer password that fits in with the theme and make sure it is in the card or on the note. The day after the wedding, when they’ve had time to find the password, you can send the money. Alternatively, you could include a cheque (check for the Americans), or, as a last resort, cash. Many congratulations on your marriage. Here’s hoping that you start it off rolling in dough. May your future hold even more, even if it is pizza dough or cookie dough that keeps you happy and well. 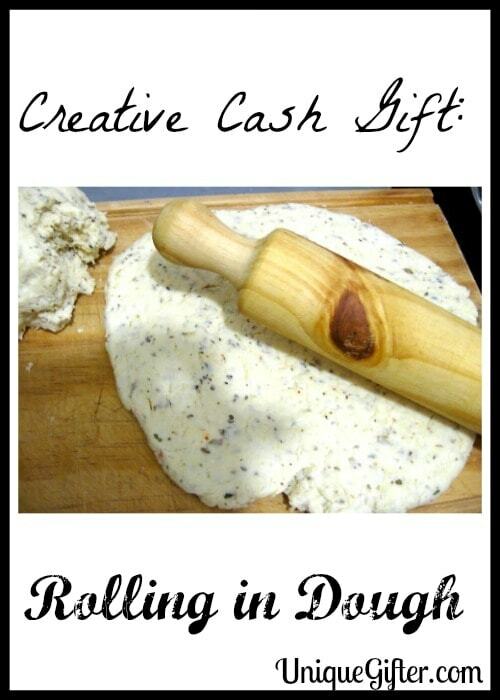 There you have it – another in the series of creative cash gift ideas. This is a really great idea! I might steal it for one of the weddings I'm going to this Fall. It is definitely an easy one! Haha that's a cool project and not too expensive, which would defeat the purpose of giving cash on top or make the couple think they'd rather have had more cash than an expensive wrapper. My recent post Are you too busy to make money? Yup! It also means you don't feel like you're spending a bunch on something they may or may not want. That note is a clincher!